I am always looking for new ways to fry an egg. I came upon this recipe in my travels, and have found it to be very interesting. it’s like a poached egg, in oil! The egg white get crackly, and the egg yolk thickens. It is perfect to top a steak, or as a change from the drab morning egg. Nothing could be further from the “perfect way to cook an egg” that Chef Ferdinand Point promoted. (He insisted the ONLY way to cook an egg was slowly, in ample amounts of butter.) The texture is unique. The Spanish fry everything in a rather bland olive oil (lacking in overall “olive” flavor). This may be cooked in a good quality cooking oil, in melted lard, or as the Spanish do, in olive oil. Heat a generous amount of oil in a heavy pan (cast iron works well) until it is nearly smoking. Then reduce the heat to medium-high, and break an egg into the hot oil. Cook eggs one at a time (several eggs will instantly migrate together and coagulate into one big shaggy mess). Tilt the pan away from you, and spoon the oil over the egg or, alternatively, roll the egg gently with a spoon to cook all sides evenly. Cook until the white is opaque but the interior is still runny. The total cooking time is less than a minute, closer to 45 seconds, for a still-runny yolk and up to 2 minutes for a firm yolk. Use a slotted spoon to lift the egg out of the oil, and let the excess oil drip off. The technique and resulting egg texture are more like those of a poached egg, but with a decidedly fried, almost crispy, exterior. People fixate on how to make the “perfect” scrambled egg. I don’t think there is any egg dish that has so many experts, so many techniques, and such a variety of opinions. It ranks up there with discussing politics or religion. The basic scrambled egg is a fried egg that mixes the egg yolk and white in a process known as beating (or whipping, depending on the recipe) and then cooking the egg by frying while disturbing the egg by stirring. The result is that the protein in the egg will coagulate into soft, moist curds. In an egg scramble, something is added to this basic scrambled egg to create new and different taste combinations. Some people whisk the eggs before cooking. Others crack them directly into the pan and mix the yolk and white in the pan through gentle stirring. Some add stock, cream, butter, milk, cottage cheese, cream cheese, melted butter, sugar, cream of tartar, vinegar, lemon juice, oil, or water when they whisk the eggs. Others insist that scrambled eggs should remain unadulterated. If you add liquid, the rule of thumb is no more than 2 teaspoons of liquid per egg. There are recipes that want you to separate the yolk from the white, whip the white until stiff peaks form, and then fold it into the yolk. These recipes create egg dishes that are something other than scrambled eggs—more akin to soufflés. Beating Eggs to Scramble: Again, it’s all a matter of taste. As stated above, some people do not really scramble the eggs in a bowl before cooking. They crack them into the pan and stir them around to break the yolks. Other people freak out and insist that the only way to “properly” scramble eggs is to crack them into a bowl and beat them with a fork, a whisk, or an electric mixer until a great deal of air is trapped in the egg proteins. Other people will tell you to not beat eggs for more than four beats. Meanwhile, the American Egg Board describes a well-beaten egg as “frothy and even-colored.” Some recipes actually recommend whisking the eggs for as long as two minutes. What directions do you follow? It depends on the type of scrambled eggs you like. If you like your scrambled eggs to have bits of yellow and bits of white in a mosaic of egg, beat your eggs in the pan and wait for several seconds before you begin to mix the two. If you want light, fluffy, even-colored eggs, lightly whisk the eggs and add a small amount of acid (cream of tartar, vinegar, or lemon) and push the eggs gently to the center of the pan. If you really like flat, tough scrambled eggs, then beat them excessively. The pounding causes the proteins to uncurl, stretch out, and then form new connections. When egg yolks and whites are beaten together, the proteins of each react to each other. If you overwhip the eggs, you will destabilize the proteins. When the proteins are destabilized, their ability to trap air and form new connections will be pushed to the limit. The egg proteins will have nothing left to connect together during the heating process. Do not confuse beating the egg yolk together with the egg white with beating egg whites alone. When making a meringue, soufflé, egg puff, or other recipe that relies on a great amount of air trapped in the long strands of the egg white protein, you will whip it for a very long time, often with an electric mixer, until the egg whites form stiff white peaks. This is a completely different egg preparation method than blending egg white with yolk until a creamy, even color. If you do use an electric mixer, do not beat for more than a few seconds. After beating, set the eggs aside to relax for a few minutes before assaulting them with heat. Push, Don’t Stir: Many scrambled egg recipes want you to stir the eggs to break up the solid omelet-like egg patty to make the more graceful, scrambled egg soft curds. The most effective way to “stir” is not to stir at all. The more accurate description is to push the eggs from the outer edges toward the center, occasionally, once they have begun to set in the pan. Since there is really no cooking instructional term that expresses “push around in the pan,” stir is what’s used, but it is an ill-fitting instruction. Do not be too ambitious during this part of the cooking process. Give the eggs time to start to coagulate, and then push them toward the center so that the uncooked runny egg can flow onto the pan and the cooked mounds can be clumped together in the center. 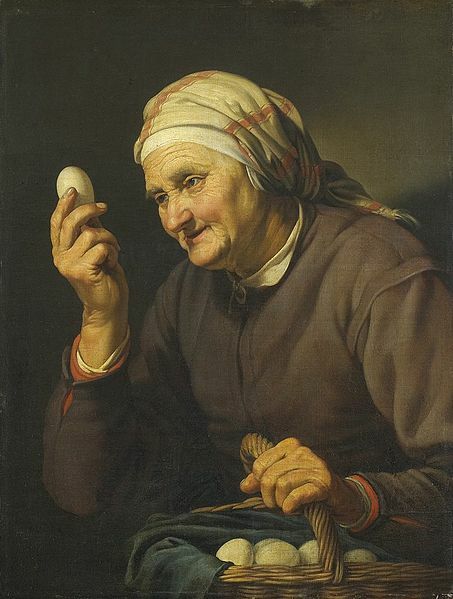 The term for how an egg becomes firm is set in some cookbooks and curd in others, and others still use terms such as firm up, solidify, or even fluff. The point is that the eggs will change in texture and cease to be liquid. Salt and Eggs: Salt is another point of contention. The old cookbooks’ motherly advice is that salt added to a raw egg will result in a tough cooked egg. (Spices, if desired, should be added after the eggs have started to curdle which keeps the spices suspended and cooked in the egg, instead of falling to the bottom of the pan.) Throughout this book, I have omitted salt from the recipes. Aside from the toughness issue, the amount of salt in new, compared to old, recipes is startling. Whereas a recipe in the 1900s would use a pinch, recipes today have ¼ teaspoon or more. My feeling is that you can salt an egg dish to taste after it is served. The Pan: Nonstick pans are often recommended for egg cooking. (Personally, I’m not fond of the concept of a heated plastic surface in contact with foods I am going to eat. Overheated nonstick cookware can release off toxic fumes strong enough to kill a canary or other pet bird. No thank you.) I prefer a cast iron pan that is well seasoned or a stainless steel one. Some people do not like cooking eggs in cast iron, because it can color the eggs ever so slightly. However, the heat-holding qualities of cast iron make it the easiest type of pan to cook eggs in, from my experience. Start by heating a dry pan until water droplets dance on its surface. Then add butter or oil and get it to a high heat, but below the smoke point. (If the oil turns dark, remove the pan from the heat immediately). Be careful not to let any water get into the pan once the oil is in it, or you may be splattered with hot oil. When you have added the eggs to the pan, turn the heat down to low. Use a wooden or metal spatula, and push the eggs from the outer edges to the center. Basic rule: lower heat + constant gentle movement = creamier eggs.